Examining owl pellets is a memorable and fascinating way to learn about microscopy and the eating habits of raptors - birds of prey such as owls, hawks and eagles. Owl pellets are the indigestible parts of an owl's meal that the owl regurgitates. They include fur, feathers and bones since the owl swallows its meal whole. The pellets are expelled after the meal. Heat sterilized at 280°F to kill any bacteria. 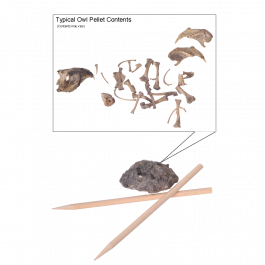 Use the two included dissection sticks to unravel what the owl ate and identify the bones with the included bone identification chart. Also includes instructions on how to explore the owl pellet and a dichotomous instruction sheet to help identify the type of animal to which the bones belong. Kit Contents: 1 Owl Pellet, 2 dissection sticks, 1 Bone Chart, 1 Instruction Sheet. Caution: Small parts - Choking hazard. Not to be used by children under 5 years of age. 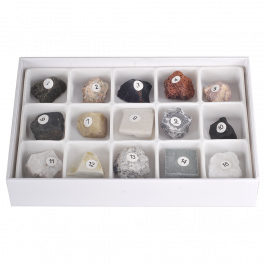 Ideal for the hobbyist collector, home schooling assignment, scouting project or hobby use, this educational rock collection includes 5 samples from each of the three major rock classifications: igneous, sedimentary, and metamorphic rocks. Igneous rocks are called "Fire Rocks", because they are the solid form of what was once molten lava. They make up 95% of the earth's crust and this collection features 5 of the most popular types of igneous rocks including granite, rhyolite, basalt, obsidian and scoria. Metamorphic rocks began their life as sedimentary or igneous rocks that came under tremendous pressure. This pressure generates a great deal of heat, which causes the rock to literally "morph" or change into a metamorphic rock. This collection features 5 of the most common types of metamorphic rocks such as slate, quartzite, marble, phyllite and Gneiss. Sedimentary rocks are formed when plants, soil and animal matter settle to the muddy bottom of inland seas, lakes and oceans. Over millions of years and thousands of tons of pressure, these layers of mud eventually turn into rock. When the seas dry up, the rock becomes exposed to the elements, creating samples like limestone, sandstone, shale and coquina bituminus coal. Each labeled specimen measures approximately 1" x 1," neatly housed in a divided storage container with an identification sheet. Choking Hazard: Small parts - not for children under 3 years. This special offer combines our brand new Omano OM123L triple-power stereo student microscope and our easy-to-use Optixcam Summit Series KK2 1.3MP digital camera, into an affordable and versatile digital microscopy lab, ideal for the home school or classroom setting. The new Omano OM-123L LED is a rechargeable LED stereo microscope with three levels of magnification: 10x, 20x and 30x. All metal with high quality glass optics, it can be used either indoors or outside in the field. 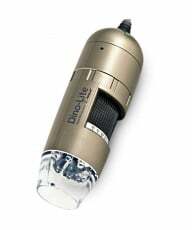 It offers exceptional value for first time users or home hobbyists and is used to view macro specimens that are visible to the naked eye such as insects, crystals, sea shells and more. Two Wide Field WF10x eyepieces combine with 1x/2x/3x objectives in a step turret magnification changer for magnification powers of 10x, 20x and 30x. Simply twist the objective housing until it clicks into place on the desired objective. The microscope also includes rubber eyeguards for improved viewing, adjustable interpupillary distance of 55-77mm and a left eyepiece diopter to allow for individual eye focusing. 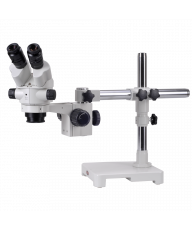 As with most stereo microscopes, the OM123L includes dual-sided coarse focus controls with over-sized knobs which are easier for student hands to use. 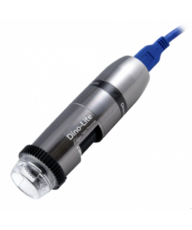 Top and bottom illumination is powered by 110V ac or rechargeable LED with three settings: top, bottom and together. The OM123L includes a pedestal stand with included top and bottom LED illumination controllable with left and right side dimmer switches. Easy-to-use, affordable and no need for power cords to trip up the young ones, it is a perennial favorite! Accessories include rubber eyecups, a reversible black/white stage plate, frosted glass stage plate, two metal stage clips, vinyl dust cover and manual. Shipping Wt. and dimensions: 12 Lb. 16" x 14" x 10". It works well with Windows operating systems and the software installs quickly so kids can start capturing images and video. The camera includes a 23.2mm smooth bore ocular mount for mounting on the eyetube or trinocular port of most modern microscopes. This package includes collars to mount to the eyetube of the OM123L. We highly recommend this camera for the hobbyist, coin-collector, home-school educator and all general microscopy use. Summary This special offer combines our brand new Omano OM123L triple-power stereo student microscope and our easy-to-use Optixcam Summit Series KK2 1.3MP digital camera, into an affordable and versatile digital microscopy lab, ideal for the home school or classroom setting. The new Omano OM-123L LED is a rechargeable LED stereo microscope with three levels of magnification: 10x, 20x and 30x. All metal with high quality glass optics, it can be used either indoors or outside in the field. It offers exceptional value for first time users or home hobbyists and is used to view macro specimens that are visible to the naked eye such as insects, crystals, sea shells and more. Optics Two Wide Field WF10x eyepieces combine with 1x/2x/3x objectives in a step turret magnification changer for magnification powers of 10x, 20x and 30x. Simply twist the objective housing until it clicks into place on the desired objective. The microscope also includes rubber eyeguards for improved viewing, adjustable interpupillary distance of 55-77mm and a left eyepiece diopter to allow for individual eye focusing. 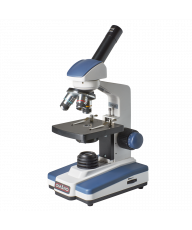 Focus & Illumination As with most stereo microscopes, the OM123L includes dual-sided coarse focus controls with over-sized knobs which are easier for student hands to use. Top and bottom illumination is powered by 110V ac or rechargeable LED with three settings: top, bottom and together. Stand The OM123L includes a pedestal stand with included top and bottom LED illumination controllable with left and right side dimmer switches. Easy-to-use, affordable and no need for power cords to trip up the young ones, it is a perennial favorite! 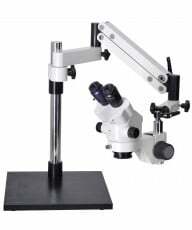 Microscope Accessories Accessories include rubber eyecups, a reversible black/white stage plate, frosted glass stage plate, two metal stage clips, vinyl dust cover and manual. Wt. and dimensions: 12 Lb. 16" x 14" x 10". Camera Summary The new OptixCam Summit K2 Series KK2-1.3MP digital microscope camera is a terrific way to turn any microscope into a fun and exciting learning tool for kids of all ages. Designed for students and young explorers, this sturdy and affordable little camera will out-perform any other camera in its price range. When used in place of a standard microscope eyepiece, students can now capture vivid images of that sea shell from vacation, the backyard butterfly, a drop of pond water, or Grandpa's coin collection. It works well with Windows operating systems and the software installs quickly so kids can start capturing images and video. The camera includes a 23.2mm smooth bore ocular mount for mounting on the eyetube or trinocular port of most modern microscopes. This package includes collars to mount to the eyetube of the OM123L. We highly recommend this camera for the hobbyist, coin-collector, home-school educator and all general microscopy use. Software The included K2View software for Windows provides for excellent color rendering and fast image processing especially when capturing multiple images. Simple, intuitive and easy-to-use controls offer image capture, notation, geometric measuring and storage in JPG, BMP, TIFF, RAW format. The software also includes auto white balance, color enhancement, anti-flicker and other image-enhancing benefits. This software is not MAC-compatible. Camera Accessories 1.3MP Digital Camera with integrated 23mm adapter, CD-ROM Software disc, USB 2.0 cable.